Award winning Interior designer and Dragons’ Den star, Kelly Hoppen MBE has taken delivery of a new British-built Vauxhall Vivaro van. HAaving already put her stamp on the homes, yachts and jets of private clients, as well as commercial projects all over the world, Kelly Hoppen’s latest creation combines glamour with practicality. The Vivaro - the lynchpin of Vauxhall’s award-winning van range – has been wrapped in a bespoke taupe wrap, displaying her logo and signature. The Vauxhall Vivaro is built in Luton, where 215 units roll off the production line per day and employs 1,300 people. 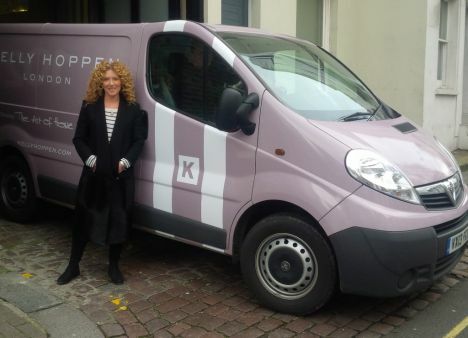 The Vauxhall Vivaro will promote her new online venture, ‘Kellyhoppen.com’. The luxury online store features a range of Kelly designed accessories, bed linen, cushions, candles and gifts, all carrying the stamp of the multi-award winning designer’s iconic neutral-yet-opulent style. Jenson Button to drive Rolls-Royce cars for the 2014 F1 season!